Metastasis of breast carcinoma to the orbit is an uncommon entity and carries a poor prognosis. This case report presents false-positive technetium-99m methylene diphosphonate activity in the right orbit of a patient with a history of a primary breast neoplasm. Orbital computed tomography imaging was obtained to further characterize the radiotracer uptake identified on the bone scan and demonstrated diffuse right globe intraocular calcifications secondary to degenerative intraocular changes. A brief literature review of orbital metastasis from breast carcinoma and causes of intraocular calcification in the context of chronic vision loss are provided. Bone scintigraphy with technetium-99m (Tc-99m) methylene diphosphonate (MDP) is a highly utilized clinical tool for diagnosing and staging metastasis of primary tumors to bone. It is often the initial screening study and has a sensitivity of 62%–89% in adults. However, radiotracer uptake can be nonspecific and can occur with nonmalignant etiologies such as trauma, inflammation, ischemia, and extraosseous calcifications. This report presents a patient with a history of chronic unilateral vision loss who underwent bilateral mastectomy for ductal carcinoma in situ (DCIS) of the left breast. 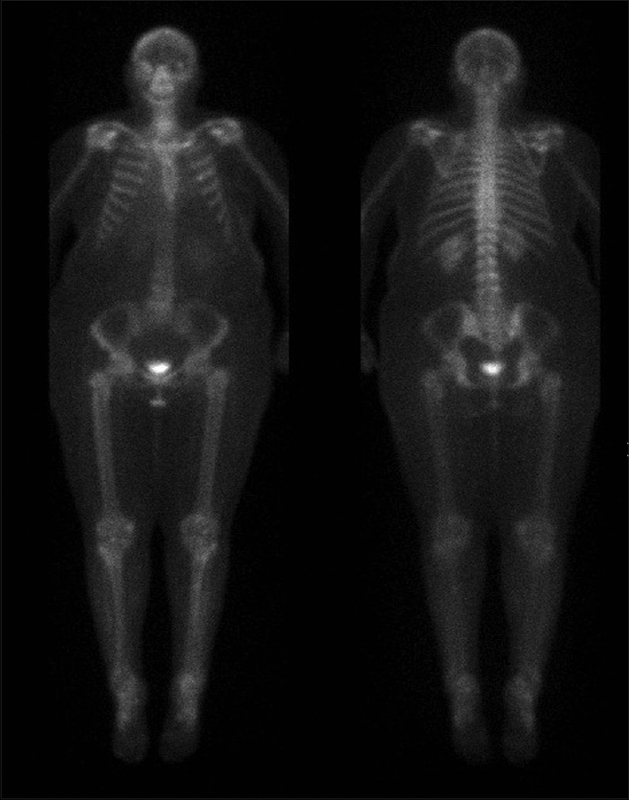 Bone scintigraphy performed 8 months following her surgery demonstrated radiotracer uptake in the right orbit. An orbital computed tomography (CT) was obtained to further localize and characterize the region of interest and revealed right-sided intraocular calcifications. These calcifications were secondary to a long-term degenerative intraocular process and were determined to be the cause of the false-positive radiotracer activity. A brief literature review of metastatic breast cancer to the orbit as well as etiologies of intraocular calcifications is provided. A 42-year-old woman was discovered to have a suspicious finding in her left breast on screening mammography. A stereotactic biopsy was performed, and the pathology was consistent with DCIS. Due to a strong family history of breast cancer, the decision was made to perform a bilateral mastectomy. A Tc-99m MDP bone scan was obtained 8 months following surgery and revealed a focus of asymmetric radiotracer activity in the right orbital region [Figure 1] and [Figure 2]. A contrast-enhanced CT scan of the orbits was obtained to localize and characterize this indeterminate activity. Irregular calcifications were noted along the posterior right globe, within the posterior natural lens and the posterior chamber of the eye [Figure 3]. The right globe volume was also decreased. The left globe demonstrated a senile calcific scleral plaque at the insertion of the lateral rectus muscle [Figure 3]b. Previous imaging of the orbits performed at an outside hospital several years prior established the temporal stability of the right intraocular calcifications. The patient's history confirmed a chronic lack of vision in the right eye, in addition to being born prematurely. The increased Tc-99m MDP activity in the right orbit was concluded to be secondary to the intraocular calcifications. These calcifications were related to degenerative intraocular changes, likely sequelae of retinopathy of prematurity (ROP). Breast carcinoma is the most common primary solid tumor to metastasize to the orbit, accounting for over 50% of orbital metastasis. 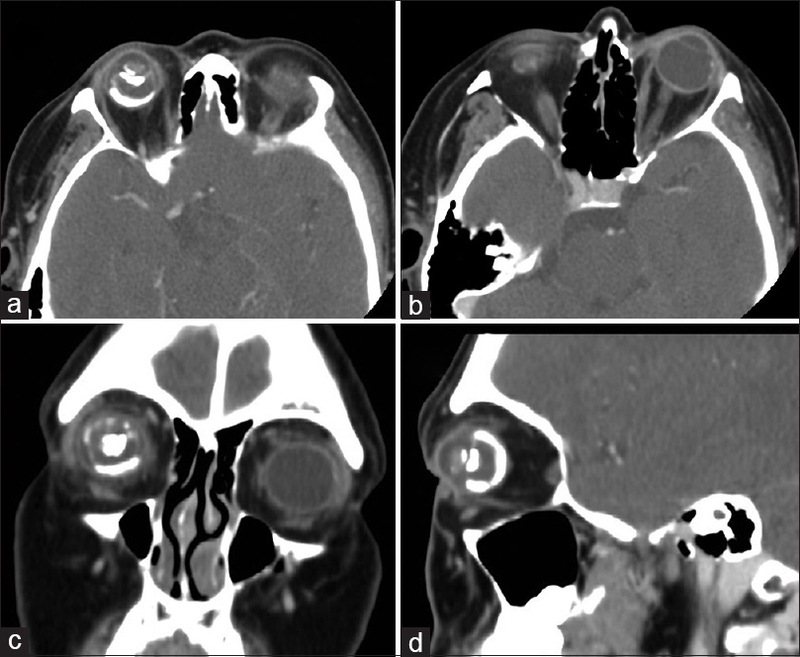 Orbital bone and sinus metastases, extraocular tumors such as intradiploic meningiomas, as well as benign “hot spots” within the frontozygomatic suture have all been reported as potential causes for Tc-99m MDP radiotracer uptake in the orbit.,, In our case, the cause of the orbital radiotracer activity was attributed to diffuse intraocular calcifications identified on orbital CT. The intraocular calcifications have a broad differential diagnosis and can be placed into five main categories including neoplasms (e.g., retinoblastomas, hamartomas, choroidal osteomas, hemangiomas), metabolic (e.g., hyperparathyroidism), degenerative (e.g., optic drusen, posttraumatic, postretinal detachments, scleral plaques, ROP, Coats' disease, persistent hyperplastic primary vitreous, mature cataracts), congenital (e.g., Sturge–Weber syndrome, von Hippel–Lindau syndrome), and infectious (e.g., toxoplasmosis, cytomegalovirus, toxocariasis). Many of these disorders can progress to phthisis bulbi causing a shrunken and disorganized eye. The patient's premature birth history and distribution of intraocular calcifications within the lens, choroid, and retrolental tissues are typical for severe progressive ROP, making it the most likely etiology. Metastasis of primary breast neoplasms makes up a high percentage of all metastatic orbital tumors and carries a poor prognosis. To the best of our knowledge, this is the first report of a false-positive Tc-99m MDP bone scan within the orbit following a recent diagnosis of breast carcinoma. The intraorbital focus of radiotracer activity was secondary to stable intraocular calcifications, likely sequelae of end-stage unilateral ROP. With the growing incidence of ROP worldwide and improving survival rates of breast cancer, similar false-positive bone scans within the orbits will likely increase in the future. Flickinger FW, Sanal SM. Bone marrow MRI: Techniques and accuracy for detecting breast cancer metastases. Magn Reson Imaging 1994;12:829-35. Peller PJ, Ho VB, Kransdorf MJ. Extraosseous tc-99m MDP uptake: A pathophysiologic approach. Radiographics 1993;13:715-34. Shields JA, Shields CL, Brotman HK, Carvalho C, Perez N, Eagle RC Jr., et al. Cancer metastatic to the orbit: The 2000 Robert M. Curts lecture. Ophthal Plast Reconstr Surg 2001;17:346-54. Crawford TS, Kleinschmidt-DeMasters BK, Lillehei KO. Primary intraosseous meningioma. Case report. J Neurosurg 1995;83:912-5. Tiwari V, Pande SC, Verma K, Goel S. Paranasal sinus and retro-orbital metastasis in a case of breast carcinoma: A clinicoradiological review. BMJ Case Rep 2014;2014. pii: bcr2014204094. Thang SP, Tan AE, Goh AS. Bone scan “Hot spot” at the superior lateral orbital margin fronto-zygomatic suture uptake characterized with tc-99m MDP SPECT/CT. World J Nucl Med 2011;10:139-40. Hedges TR 3rd, Pozzi-Mucelli R, Char DH, Newton TH. Computed tomographic demonstration of ocular calcification correlations with clinical and pathological findings. Neuroradiology 1982;23:15-21.